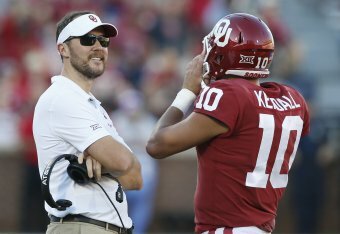 Even with incoming five-star quarterback Spencer Rattler and two-time national champion Jalen Hurts on the roster, Lincoln Riley still blocks Austin Kendall from transferring to WVU. By blocking Kendall, that prevents him from being eligible for the 2019 season and gives him one year of eligibility remaining instead of one. Riley is able to do this because West Virginia and Oklahoma are both in the Big 12. Many assumed that once Hurts committed to Oklahoma that would result in Oklahoma allowing Kendall to transfer where he desires. Instead, they are still blocking Kendall. This is despite the past two Oklahoma quarterbacks transferring and becoming Heisman winners. Judging by his Twitter behavior, Riley is very sensitive about the subject. When called out by Clay Travis, he immediately blocked him. The outspoken Travis did not hesitate to put him on blast. So @LincolnRiley is blocking @A_Kendall11 from transferring to West Virginia while recruiting Jalen Hurts to take Kendall’s job? Damn, that’s a bad look for Riley and Oklahoma. In the past few hours Riley has been repeatedly lit up on Twitter. Not just by West Virginia fans and media. It’s pretty unanimous that Riley should do the right thing and allow Kendall to transfer where he wishes. Report that Oklahoma is blocking transfer QB Austin Kendall from becoming eligible in 2019 as grad transfer at WVU, while Oklahoma pursues Jalen Hurts as a grad QB for 2019. Hey OU: Shame.Shame. Shame. The fact that @LincolnRiley is blocking @A_Kendall11 from transferring to West Virginia is 100% garbage and weak. He was recruiting Jalen Hurts to start at #OU in 2019. But want to control where Kendall goes. Coaches must have more confidence to overcome a conference transfer. On top of the Hurts/Kendall saga, there is more when it comes to incoming Sooner five-star quarterback Spencer Rattler. When there were rumors that Justin Fields of Georgia could be headed to Norman, Riley assured him they weren’t adding anymore quarterbacks, including transfers. Apparently things have changed in the last couple weeks. Interesting enough, Spencer Rattler is coming in as OU’s top signee for 2019. When the Justin Fields rumors were swirling, Rattler said Lincoln Riley told him they weren’t taking anymore QB’s, including transfers… fast forward and now Hurts is coming. ???? Despite this, Rattler has said all the right things and said it will be great competition with Hurts on campus, despite Riley breaking his promise. "I love it. Jalen is a great player and I’m excited to get to play with him. It’ll be great competition for sure.” – @SpencerRattler is all aboard #Sooners landing @JalenHurts. West Virginia fans are up in arms over the situation. Blocks QB Austin Kendall from Transferring to WVU and not letting him pursue his opportunity to play elsewhere and achieve his goals. The rich get richer.. #OU picks up Jalen Hurts and blocks Austin Kendall from transferring to #WVU and becoming immediately eligible. Gotta love the BIG 12.. the ONLY conference that allows teams to do things like this. Stewart Mandel maintains that Mountaineer fans still have reason to believe that the situation will end in their favor. It’s been a very interesting day in college football in the middle of January. Time will tell if Oklahoma holds onto their block and forces Kendall to go elsewhere. One positive is this probably makes Kendall to go to West Virginia even more where he can get revenge on the Sooners for this fiasco.